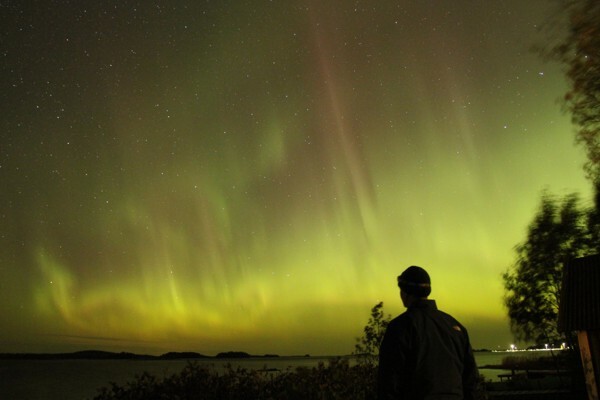 Observing northern lights (aurora borealis) in September 2011. Since September 2012 I work at the Centre for Metrology and Accreditation (MIKES) (since 2015 VTT MIKES Metrology) with timekeeping, time&frequency transfer techniques, and the construction of an optical atomic clock. My PhD work involved the design/construction and application of an Optical Tweezers instrument at the Electronics Laboratory, Department of Physics, Univeristy of Helsinki. Various hobbies I'd like to get better at: orienteering, running (e.g. 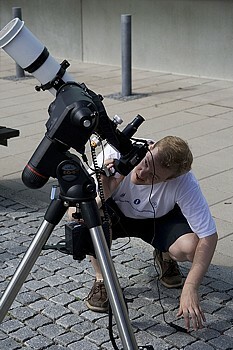 marathons), photography, astrophotography and telescope making. I'm also interested in computer aided manufacturing, specifically the algorithms behind toolpath calculation and trajectory control of CNC machines with open-source software like LinuxCNC(formerly EMC), and how to calculate toolpaths. I have an experimental C++ library for 3D milling toolpath generation called opencamlib and another for 2D toolpaths called openvoronoi. There's also a separate CAM Page. 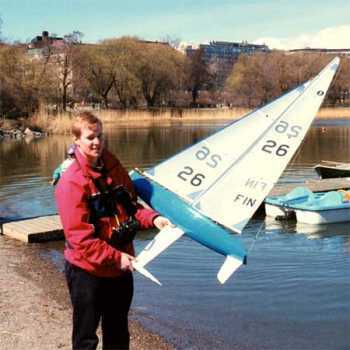 Previously I did a lot of radio controlled sailing boats: designing, building, trimming, and racing. I've made a list of Model Boats I've owned. 1997-1998, 11 months of military service in the Finnish Navy. 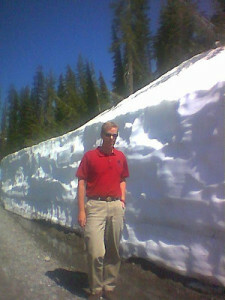 2002, M.Sc. in Physics, University of Helsinki, Department of Physical Sciences. 2003-2010, PhD studies in Physics/Biophysics at the University of Helsinki. A joint project between the Department of Physical Sciences and the Institute of Biotechnology. 2011, PhD in Physics, University of Helsinki. 5.5.1997 - 20.10.1997: Digitizer, Mallon Technology Finland Oy. 1.7.1999 - 13.8.1999: Digitizer, Mallon Technology Finland Oy. 2000 / 3 months: Research Asistant, University of Helsinki, Department of Physical Sciences. 1.1.2003-31.6.2003: Amanuensis (acting), University of Helsinki, Department of Physical Sciences. Maintenance of IT services for the theory department. 1.1.2003-31.12.2003: Assistant (acting), University of Helsinki, Department of Physical Sciences. Supervising lab-courses for 1st and 2nd year students. 1.1.2004-31.12.2005 Researcher (Graduate Student), University of Helsinki, Institute of Biotechnology. 1.1.2006 - 31.12.2007 Employed as a Graduate Student by the Finnish National Graduate School of Nanosciences. 1.1.2008 - 31.12.2008 Personal grant from the Jenny & Antti Wihuri foundation. 1.7.2011 - 7.9.2012 postdoc at Department of Physics, University of Helsinki. 17.9.2012 -> Research Scientist at the Centre for metrology and accreditation (MIKES). Working with the construction of a single-ion optical atomic clock. Roughly in reverse chronological order. See also ResearchGate or Google scholar or ResearcherID. Videos: 461nm fluorescence of Strontium in an ionization-cell, and in the trap. 422nm fluorescence from trapped Sr+. Thermal expansion of an ULE cavity. A. Wallin, T. Lindvall, K. Hanhijärvi, "Hajautetut vikasietoiset kelloverkot" (Distributed fault-tolerant clock networks), MATINE tiivistelmäraportti, ISSN 1797-3457, ISBN 978-951-663-049-9. M Doležal, P Balling, P Nisbet-Jones, S King, J Jones, H Klein, P Gill, T Lindvall, A Wallin, M Merimaa, C Tamm, C Sanner, N Huntemann, N Scharnhorst, I Leroux, P Schmidt, T Burgermeister, T Mehlstäubler, and E Peik, "Analysis of thermal radiation in ion traps for optical frequency standards" (2015). arXiv:1510.05556, Metrologia, dx.doi.org/10.1088/0026-1394/52/6/842. My PhD thesis thesis consists of a summary of four papers: Wallin Anders, "Optical Tweezers for Single Molecule Biology", University of Helsinki 2011, HU-P-D181, ISBN 978-952-10-6879-9 (print), ISBN 978-952-10-6880-5 (PDF). ISSN 0356-0961. A. E. Wallin, H. Ojala, G. Ziedaite, and E. Hæggström, (2011), “Dual-trap optical tweezers with real-time force clamp control”, Review of Scientific Instruments 82 083102. (DOI: 10.1063/1.3615309). Also selected for Vir. J. Bio. Phys. Res. 22 (4) (Open Access through HELDA: http://hdl.handle.net/10138/27789) Youtube video: See how Lambda exonuclease shortens DNA held at constant tension. Jelena Telenius, Anders E Wallin, Michal Straka, Hongbo Zhang, Erika J. Mancinid and Roman Tuma, "RNA packaging motor: From structure to quantum mechanical modeling and sequential-stochastic mechanism", Proceedings of the 2nd Mathematical Virology Workshop. I have reviewed papers for: IEEE TUFFC, Nano Letters, Optics Express, Review of Scientific Instruments (I was on their list of reviewers in 2011 and 2012), Applied Physics B, and IEEE Transactions on Industrial Informatics. 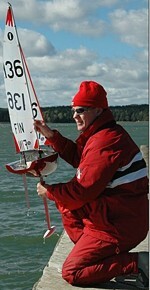 At Töölönlahti with Italiko IOM yacht in May 2003. 2016 November, I gave a talk at ITSF2016 in Prague, "Comparing H-masers over a 280 km White Rabbit link"
P. Tavella et. al. "The European Project DEMETRA, Timing services based on European GNSS: First experimental results", 2016, 3rd International Workshop on Metrology for Aerospace, Florence, Italy, June 22-23. 2016 March, 9th White-Rabbit workshop, NIKHEF, Amsterdam. Talk on recent results and outlook for White Rabbit in time&frequency metrology. 2014 November, "Time Transfer in a Wide Are White Rabbit Network", talk at VLBI-Workshop, Groningen, the Netherlands. 2014 June, "Time Transfer in a Wide Are White Rabbit Network", talk at EFTF 2014, Neuchatel, Switzerland. A.E. Wallin, T. Fordell, T. Lindvall, I. Tittonen, and M. Merimaa, "Trapping and laser cooling of a single Strontium ion", 48th Annual Meeting of the Finnish Physical Society, March 11-13, 2014, Tampere. 2013 May, poster on the clock laser for the MIKES ion clock presented at Finnish Optics Days, Helsinki, Finland. 2009, contributed talk and paper: "High-resolution optical tweezers for investigating DNA binding/translocating molecular motors", SPIE Optics & Photonics August 2-4, 2009, San Diego, CA, USA. 2008, poster at 1st International Symposium on Optical Tweezers in Life Sciences, Berlin, Germany, 15 May 2008. 2007 contributed talk and paper: "Real-Time control of optical tweezers", A.E. Wallin, H. Ojala, A. Korsbäck, E. Haeggström, and R. Tuma. SPIE Optics and Photonics, San Diego, California, August 26 - 30, 2007. 2005, poster: A. Wallin and R. Tuma, "Beam-stabilized High Resolution Optical Tweezers", Biophysical Society 49th Annual Meeting, Long Beach, California, 12-16 Feb 2005. 2005, poster at Finnish Physics Days 2005, 17-19 Mar 2005, Espoo, Finland. 2004, poster: Wallin A. and Tuma R., "High Resolution Optical Tweezers for Studying Viral Molecular Motors", International Conference on Biological Physics, Gothenburg, Sweden, 23-27 Aug 2004. A list of courses I have taught on. UH is short for University of Helsinki, Department of Physics. 2007: I co-supervised Heikki Ojala's M.Sc. thesis "Stiffer Optical Tweezers through Real-Time Feedback Control"
2008: A 1 h lecture on "Single Molecule Techniques" as part of the UH course "Nanoscience IV: Bionanoscience"
2008: I co-supervised Anders Korsbäck's B.Sc. thesis "Simulation of a proportional position-clamp algorithm for feedback-controlled optical tweezers"
2008: I supervised Antti Rahikkala's B.Sc. thesis "Computer Controlled Pressure Controller for Lab-On-Chip Applications"
2009: I supervised Ville Heikkinen's B.Sc. thesis "High-throughput single molecule experiments: tethered particle motion and flow-stretching, data analysis and simulation"
2009: I supervised Antti Rahikkala's M.Sc. thesis "Stretching single DNA-molecules with temperature-stabilized optical tweezers"
2010: I supervised Kalle Hanhijärvi's M.Sc. thesis "Combined optical trapping and single molecule fluorescence"
2007 and 2011: Lecturer, UH: (530190) Methods in Single Molecule Biophysics, (3op/2ov) , Fall 2007, a short course on single molecule biophysics and the various experimental techniques used in this field. 2012: I supervised Anders Korsbäck's M.Sc. thesis "Simulation of longitudinal string waves through a single polymer molecule"
2007: Life Science & Biotechnology Paper Contest Category Winner (with Heikki Ojala as co-author), NIWeek-07, National Instruments, Austin, Texas. 2009-2012: With prof. Edward Haeggström I co-authored an Academy of Finland grant which was awarded 520 k€ funding for 4 years . In Turku with 'Cockatoo' IOM yacht in September 2006. Various articles, mostly in Finnish or Swedish that I've written for magazines, but usually just for the Finnish radio-sailors' yearly 'Styyra' newsletter. Miten menestyä RC-purjehduksessa ?, Styyra 2000, "How to succeed in radiosailing - part 1"
Miten pärjätä kilpailuissa Osa 2, Styyra 2001, "How to succeed in radiosailing - part 2"
1m-rikin strategiset mitat, Styyra 2002, "The Strategic Measurements of an IOM-rig", summarized in my IOM rig-comparison. 1m veneen laminointi, Styyra 2002, "Moulding an IOM hull"
Noux Bulbiprojekti, Styyra 2003, "The Noux keel bulb project", see also Making a Bulb. IOM-Lajiesittely, Pienoismalli 2/2004, "An introduction to the IOM-class"
IOM-MM, Pienosmalli 2/2004, "IOM-Worlds 2003, Vancouver, Canada"
IOM EM, 7-16.10.2004, Arcos, Espania, Styyra 2004, "IOM Euros, Arcos, Spain" see also Arcos pictures. IOM Mastomateriaalit, Styyra 2004, "Mast materials for an IOM"
IOM PM 2005 Veddelev, Tanska, Styyra 2005, "IOM Nordics, Veddelev, Denmark", see also Veddelev pictures. 2005 IOM-MM, Mooloolaba, Queensland, Australia, Styyra 2005, "IOM Worlds, Mooloolaba, Australia", see also Mooloolaba pictures. IOM-luokan MM, Marseille, Ranska, Pienoismalli 8/2007, "Marseilles IOM-Worlds report"
Photographing the partial solar eclipse on August 1st, 2008. At the finish of a wet and cold Stockholm marathon 2012.